This mod still works with both updates 1.67 and 1.69. New Create-A-Sim and Create-A-Pet animations. All of these have been tested in my game and seem to work fine. However, if you do run across one of them that isn't working correctly, then let me know and I'll try to see if I missed something in the coding. Sims (child - elder) will still move when you select species (i.e. werewolf, fairy, ect.) or traits (i.e. Bookworm, Insane, ect. ), but the pets will only move when you select traits (i.e. clueless, genius, ect.). I have also noticed, a time or two, when you select the witch species the sound file will play too, even if you have it muted. However that glitch is rare. There are 9 versions, hopefully covering all the bases on whatever option you may want to use. Version one has both model poses for the sims and the pets. These are the original model default poses. Sims and pets will not move at all (except in circumstances explained above). The toddler should only sit briefly when you select their species as witch. Version two has the model pose for the sims and the picture pose for the animals. Dogs and cats are sitting and horses have their heads tilted slightly to one side. This horse pose only varies slightly from the model pose. Sims and pets will not move at all (except in circumstances explained above). The toddler should only sit briefly when you select their species as witch. Version three has the sims with a model pose and regular actions for animals. Sims will not move at all (except in circumstances explained above). Animals will move like normal. The toddler should only sit briefly when you select their species as witch. Version four has the sims with the picture pose and the animals with the model pose. Sims and pets will not move at all (except in circumstances explained above). The toddler should only sit when you select their species as witch. Version five has the picture pose for the sims and pets. This is a standard neutral pose with no smiling or shifting. Dogs and cats remain sitting at all times. Horses have their heads tilted slightly to one side. The horse picture pose only varies slightly from the model pose. Sims and pets will not move at all (except in circumstances explained above). The toddler should only sit briefly when you select their species as witch. 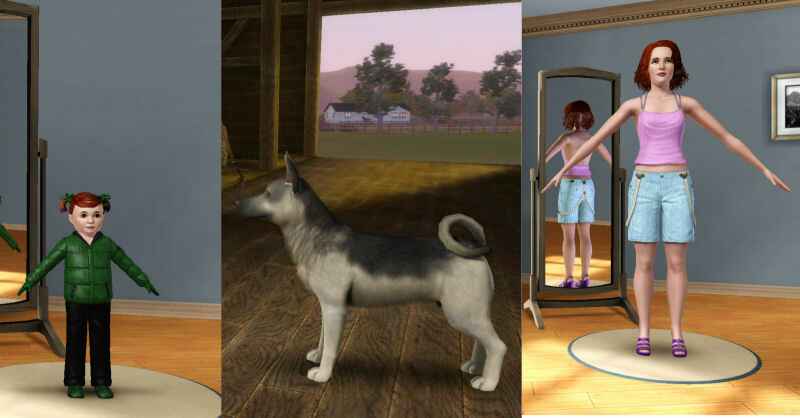 Version six has the sims with a picture pose and regular actions for animals. Sims will not move at all (except in circumstances warned about above). Animals will move like normal. The toddler should only sit briefly when you select their species as witch. Version seven has the sims acting normal (w/toddler standing) and the animals with the model pose. Animals will not move at all (except in circumstances warned about above). Sims will move like normal. Toddler will sit down briefly when you choose any species. The toddler will take longer to stand up when switched to fairy because it waits for their wings to grow. It happens when switching from human to fairy, but not when you are choosing what type of wings you want. Version eight has the sims acting normal (w/toddler standing) and the animals with the picture pose. Animals will not move at all (except in circumstances warned about above). Sims will move like normal. Toddler will sit down briefly when you choose any species. The toddler will take longer to stand up when switched to fairy because it waits for their wings to grow. It happens when switching from human to fairy, but not when you are choosing what type of wings you want. Version nine is extremely basic. 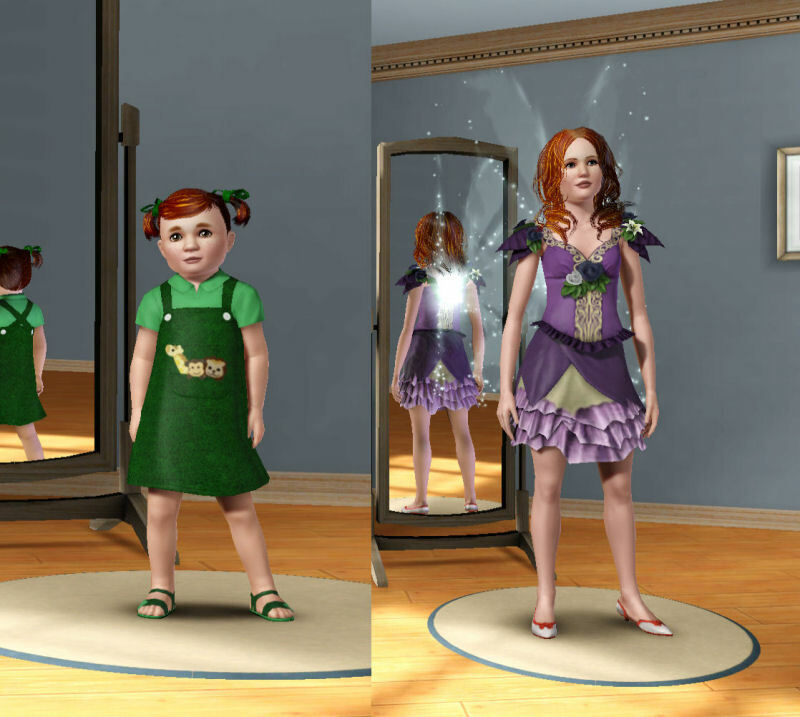 This has regular CAS and CAP actions for both sims and pets, but the toddlers are standing (essentially the original "Toddlers can stand mod" with a new adjusted camera). Toddler will sit down briefly when you choose any species. The toddler will take longer to stand up when switched to fairy because it waits for their wings to grow. It happens when switching from human to fairy, but not when you are choosing what type of wings you want. If you decide not to listen (like uselessly putting 2 versions in your game at the same time) and your game crashes, then don't blame me for any issues! BTW, I finally figured out why the toddlers were sitting briefly. Not actually a glitch. Apparently, the species selection is much like the traits selection and each has their own Jazz file. I'm tinkering with the traits files to see if I can freeze those animations too without affecting the actual gameplay. However, not only is it an awful lot of Jazz files, but it also takes a lot of sifting through code. I'm not sure if it'll ever be feasible. I'll keep trying to get them to work though. If so, I'll upload them (seriously don't look for it anytime soon...all my testing so far, still hasn't made them work right). I do actually have an idea about why the toddler poses are affected in some of these mods by the witch and nothing else, but that can't be changed in this basic mod. This mod is Incompatible with any other Mod that change the CAS animations or the CAS camera (including previous versions by myself or jonha). It should be base game compatible. Works with everything up through Into The Future EP. I tested them all and had no issues. However, if anyone has any issues please check to see if you have any conflicting mods. If that is not the case then let me know what version you are using so I can look at it.. It will conflict with any other mod changing the same resources. Makers of S3PE , SmoothJazz, and jonha for his original PrePets version.